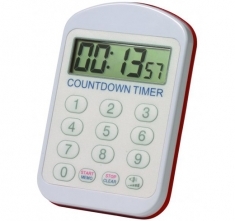 This countdown timer offers IP65 waterproof protection. The large digital display and loud audible alarm, with variable volume control, is ideal in busy professional kitchens. The countdown timer is programmable via the keypad, allowing the user to set times up to 99 hours, 99 minutes and 99 seconds. The timer incorporates magnetic pads and a keyhole slot for wallmounting or attaching to an appliance.